Nim Nadarajah is a Senior Technology Executive with over 20 years of leadership experience. Nim is a trusted advisor to CxOs, VPs, and Directors at many levels. Skilled in helping executives define and execute their technology and business systems transformation visions, he has worked in many different industry sectors such as healthcare, bio-technology, capital markets, insurance, manufacturing, and energy. Nim has honed his coaching and mentoring skills, managed globally dispersed teams, and lists his key areas of focus as Enterprise Technology and Digital Transformation, Cybersecurity, Security Strategy, Risk and Compliance, and CIO Advisory. Taking a consultative approach to problem solving and a facilitative approach to leadership, Nim endeavors to provide strong, reliable thought leadership while adhering to the big picture. 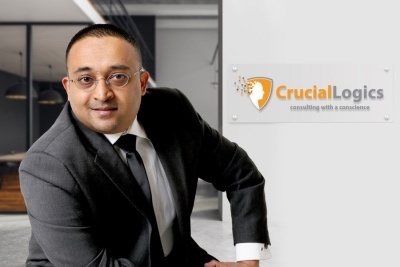 At CrucialLogics he leads the CxO Advisory and Assurance practices; where through Consulting with a Conscience™ he partners with technology and business leaders to improve their digital quotient. Nim has a passion for designing organizations that generate exponential results. Aligning with the strategic leadership mandates, building the right governance framework, and ensuring enterprise change management is a crucial part of any transformation has enabled Nim to generate the right results for his clients. Nim’s secret is his canny ability to integrate business and technology seamlessly, enabling the creation of business value and maximizing results through investing in and leveraging technology. Nim has a BSc. in Geophysics and Psychology, MBA in Technology Risk and Governance, is a certified Project Manager by PMI (PMP), holds a Six Sigma Green Belt (SSGB) and a Certified Scrum Master (CSM).